Set among the rolling hills of north Denton County, the unique community of Pilot Point has much to offer residents and visitors alike. 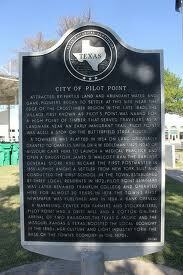 As the oldest settlement in Denton County, Pilot Point is a Texas Main Street City and its commercial district is listed on the National Register of Historic Places. The area's rich, sandy soil is ideal for training horses and Pilot Point is home to more than 300 horse ranches catering to a variety of breeds. Countless recreational activities are available at nearby Ray Roberts Lake State Park and the Ray Roberts Greenbelt is a 20 mile multi-use trail system that extends from from Lake Ray Roberts to Lake Lewisville. Pilot Point Schools are among the best in the area and offer outstanding academic and athletics programs. Listing courtesy of All Cities Realty. Listing courtesy of Herrin Real Estate, LLC.